· Consider the technology and philosophy behind block-chain and more specifically bitcoin and its relatives. · Use this information to make some forecasts of where the currency values are heading. I don’t propose to give a full account of the technology here, I am not a block-chain expert and there are many who would do it much better. There are links at the end of this post and Google is your friend. However there are a few key points to note. Block-chain and bitcoin may be new but many of the technologies it uses existed before 2008; namely the encryption methods that allow anonymity, the internet itself which facilitates the distributed recording and validation, and even the creation of referenced blocks. However it is the combination that gives the technology its potential. Note, I refer to the technology here and not Bitcoin or even “cryptocurrencies” in general. Because there are potentially many other uses of block-chain that do not involve the creation of a currency. And indeed investment in these may well be worthwhile, though rather like the original internet I suspect that most of the best inventions will be created, or at least acquired by large corporations – pick those corporations and you can perhaps make a decent return. But at the moment it is the currencies that are being hyped, (of course they are, as we will see Neptune in the foundation charts is at 22 degrees!) and so it is the currencies that we will primarily concern ourselves for much of this article. To understand the hype, or perhaps to negate it, we need to take a step back and look a currencies in general. We all know the definitions currency is: i) a unit of account, ii) a medium of exchange and iii)a store of value. And of course we all know that (unless they have intrinsic and widespread appeal in themselves), they are no good as ii) and iii) if there is no trust between the parties: Mr Mugabe take a bow. (Even a currency’s use as a unit of account is put into question if it is worth 1millionth of its original value, unless you have a ledger capable of recording Pi exactly!) But it is no joke, we should do well to remember what the Germany hyperinflation of the 1920s produced in its wake and we’ll return to the subject of inflation later. Of course, now, hard currency forms a minute fraction of all the money in circulation but that was not always the case. Once upon a time there were just coins. Why do we need money? To simplify trading in increasingly complex societies where for reasons of demand, time and location barter won’t work. I.e when I supply some financial astrology services I will get paid in gold which I will use later to purchase food for my cats! It is most unlikely that you will give me cat treats in exchange for my services. Intrinsic value: Gold, and other precious metals, had value for their ornamental qualities. And, of course. because they were available in limited quantities, their desirability was preserved. They were thus obvious choices. And in general we can assume that values of the “currency” at this point were relatively stable against other assets and commodities. If you received a coin you knew what it was worth in terms of bread, clothing and shelter etc. Portability: because all exchange was physical they needed to be portable. Again the value of metal per ounce/kg was high so only a small amount needed to be carried. There is also one other characteristic that, almost by definition, is rarely of interest to the user but has potential importance, namely that traditionally currency is fungible- one unit looks and behaves just like another. This does have all sorts of legal ramifications where criminal activity takes place and innocent parties receive money from that party later on but for most purposes is something that is just taken for granted. But what we are missing from this is where the money came from. Obviously in a simple system A mines the gold and uses it to pay for food, thus releasing it into the system. Over time the amount in the system rises but slowly over long periods. If the value of the commodity/currency rises a lot more people mine until the value drops again. Just like any other commercial activity whether it is worth mining depends on the cost of doing so versus the exchange value. But the value is at all times determined by the outside market based it desirability for other uses not as a currency. Currencies such as gold worked, then, because they paralleled the growth of complex societies, i.e the amount of commodities mined increased as the differentiation of tasks and size of the hierarchy within a society increased. The process was mostly incremental and did not disrupt the existing economic hierarchy significantly. It is also worth noting that although rulers did “mint” currency, they weren’t creating it they were merely branding it. No central organisation was technically required at this stage, just general acceptance as to the value of the metal etc. Of course there were other reasons for the central control of money ( taxes, etc.) but they were separate functions. The two are linked but not inextricably so. We’ll return to governments and their desires and powers later on. We need to understand the downsides of our coins too. Even in the early days of currency theft was clearly one. Safe storage and carriage became important. Fakes also appeared and validation (examination, weighing etc.) was added to the mix. It is crucial, here, to bear in mind that the fact that the currency was no longer backed by anything with intrinsic worth is NOT a problem per se. Currency becomes a sort of IOU/Bill of exchange. There is absolutely nothing wrong with that as long as others will honour it. It is a system based on faith or trust where rather than trusting an individual to honour your debt you trust the system co-ordinator. If such a system is supported by a stable State the currency still retains all its original properties. Note that, once again, a State is not absolutely required for this form of IOU to work, it just provides the fiat (the decree or other determination that a currency exists) which further support and credibility. In practice this is done by designating the state currency as “legal tender”. But I can still receive IOUs on my own currency post –it-notes from my friends if we are both happy with that – it merely means I don’t have to receive dodgy IOUs on post it notes from clients I will never see again; I can now receive “bills” that are exchangeable anywhere in the State. On the downside, we still don’t get away from the problem of theft or that of fakes. New methods must be adopted to minimise these – normally also co-ordinated by that said State. But as our currency has no intrinsic value, it can also be replicated infinitely; we are now exposed to monetary inflation created by increases in supply, even if that supply is genuine (non-fake) and mandated by the central co-ordinator. However, contrary to what you might think, once again, that is not of itself a problem .If everyone holds exactly the same amount of real wealth and of the currency, currency inflation will have no effect on the system whatsoever. The problem is that devaluing the currency makes real assets or commodities more expensive in relation to income based in the currency. The problem is NOT the inflation of the fiat currency itself, it is the magnification of the inequalities that result. Finally, for completeness, although paper money often has serial numbers, for all intents and purposes it is still as fungible as the coins were. The serial numbers are merely part of the creation validation mechanism, no-one maintains of record of who owns which ones at any point in time. I want to quickly say something about banks. They have two functions that are relevant here: security of your currency asset and lending brokerage. These are two completely different functions, just bundled together for convenience. And I’m not going to harp on about fractional reserve banking in the way that many others do. It is a red herring and all the qualities of currency that concern us can be dealt with without reference to it. I just want to address the fact that stage three in currency development is for it to lose it physical form altogether. Now instead of holding a note saying “ pay the bearer the sum of”, we have an account. It is still an IOU but now we can store our IOUs “safely” in a ledger and the manager of that ledger ( the bank) will offer further IOUs and accept IOUs for us (for fees of course!). Again, we don’t need a government to organise this- although by convention we tend to hold our accounts in our State branded units. Our trust in the currency remains with the State, our trust in the “storage” is in the banks ( subject to any State guarantees). And, again, to complete the picture the “IOUs “ in these accounts are still fungible. I don’t care and you don’t care, nor can either of us tell, whether the transfer of virtual bills the bank made on my behalf to pay you for my cat food came from my client last Thursday or from my Great Aunty Mabel as a Christmas present. Obviously the advent of computers meant that the ledger IOUs got digitised. Nothing changed about the nature of the currency itself. And of course with that digitisation came new theft/security risks. The methods might change, the fundamentals of the system did not. It must be apparent from the foregoing that all currency ( the “bills” or “IOUs”) held by us (whether coin, paper or ledger) is just debt owed to us by others. When we borrow we just get given some tradeable IOUs ( that we can pass on in payment for a house/car etc) in exchange for the lender receiving our longer term IOUS and fees ( interest etc). Now that is another thing that doesn’t matter per se. Indeed it is inherent in the system and when the system works it is absolutely fine. The problem, which I have dealt with extensively elsewhere, is that people and governments take on too much debt. · Maintain a military and /or law enforcement. If it sees its stability threatened it will legislate and or act accordingly. And be surrounded by a whole lot of lawyers rubbing their hands together in glee. It is worth reviewing the history and hype of the internet at this point. Remember that free and easy marketplace and free speech platform that the early adopters preached about. Now remember the Spyware act in the US, Data protection in Europe, Intellectual property cases, debates about inappropriate content on social media and whether the social media sites ( or the IP providers etc) should be monitoring them and especially remember the on-line gambling bans. And that does not include China, and other regimes where information is carefully managed, e.g. Turkish social media ban following the alleged attempted coup. But it is not just directly applicable regulations that they can control. Yes, governments can stop sites, they can block whole chunks of the infrastructure from working and they can even get into the supply chain and taking out the innocent middle man to stop the operation taking place as they did with credit card providers in the gambling example. They’ll get their hands on the taxes too; somehow… at some point in the chain, even if they just have to collect sales tax from sellers or raise import duties. And as a last resort they’ll send in the military. All this we need to bear in mind when considering how likely we are to have a new significant currency take over. That’s the basics of traditional currency then, so how do these so called “crypto currencies” differ? Obviously, by definition, crypto currencies are not coins or notes etc. They are entries on a digital ledger. But they have some special properties that separate them from the digital currency accounts already discussed . · Double-spending is prevented with a peer-to-peer network. · No mint or other trusted parties. · Participants can be anonymous. · New coins are made from Hashcash style proof-of-work. · network to prevent double-spending. We’ll now look at these characteristics within the context of the properties of money to establish to what extent they differ from traditional currencies and to what extent those differences make them more or less attractive. Note that Satoshi doesn’t call Bitcoin a crypto-currency, he calls it a peer to peer one. The key feature of Bitcoin is its peer to peer facility. So in theory we get round the problem not just of the dodgy third party but we also do away with the bank central government money creator/coordinator ( I won’t use the word mint as this suggests coins rather than IOUs). As we’ve seen this central co-ordinator is not a pre-requisite for any system and its purpose has been provision of an underlying level of trust; the safer the State the safer the currency . In theory, with this blockchain and the distributed and secure technology we don’t need a trusted central party. Validation is done by the system as a whole (for a fee) and security is built in. We can circumvent the state. But if you trust your State even marginally why would you need to circumvent it and replace it with random selection of people across the globe? However, there is also the other question of trust; to what extent does the State inflated away the value of its currency by increasing its supply – we’ll look at that under “the value of bitcoin” at the end of this section. Double-spending is prevented with a peer-to-peer network and The proof-of-work for new coin generation also powers the network to prevent double-spending. However as we know, it is possible for any system to be breached. Coins could still be double spent in fractions of a second, especially as volumes increase. I am prepared to be persuaded this can be prevented but I am not yet convinced. Although there is no “mint” for creation, the trusted party problem may remain for storage. Exchanges weren’t in Satoshi’s summary as clearly they negate the peer to peer nature of the currency. Anyone with any knowledge of Bitcoin at all will have heard of the Mt Gox fiasco (opened 18 July 2010, initial hack, 19 June 2011, closed 24 Feb 2014) and the arrest of its founder (1 Aug 2015). But other exchanges have had problems too: the alleged Ponzi , Bitcoins savings and Trust (17 Aug 2012), and the hacked Linode (1 March 2012). So a wise true peer-to-peer holder needs to keep their coins in a hardware wallet or write down the details. Even then there is a risk of loss of wallets (destruction of your computer/loss of access details). And I’m not sure what happens to your bitcoin wealth if you die without passing on the details of your wallet/coins. And, interestingly, if the system remained truly peer- to- peer there would be no exchanges you could buy bitcoin from anyway………. In Satoshi’s model, you would receive bitcoin in payment for something. In practice people are buying it. But to buy it you need to spend a traditional currency. You are NOT, until you are actually in possession of your validated Bitcoins, benefiting from the technology that manages them so you run all the risks that buying any other commodity with traditional payment incurs. For Bitcoin to overtake traditional currencies such as dollars, for example, it would need to stop being a commodity that people want to purchase and start being a currency that people choose to use. i.e They can be “mined”. In this way they are more like precious metals in that they can be obtained at source by workers. Of course just like any mining you have to be in it to win it. And just like any other form of manufacturing it is cheaper some places than others. Ironically it is differences between states that create environments more or less favourable for mining. China policy on electricity as made it a preferred location. Mining has got more attractive as the price has risen but the in- built halfing mechanism that slows the increase in supply has the opposite effect. 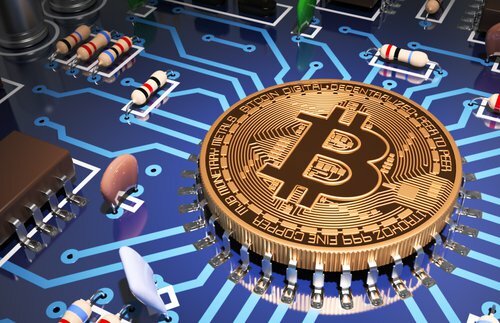 Satoshi did not deal with inherent inequalities in the system ; whether regional, economic (ability to buy the equipment) or knowledge based – ability to “mine”. Tacitly his concept was the implication that everyone could mine in the same way if they chose. There are therefore potentially some inherent problems in the issuance that reduces the likelihood that the currency will ever be widely held. But that also depends on other factors that we will address at further on. Due to the public/private encryption only the coin and its payment history is identifiable and not the owner. Of course, as we already established the average person doesn’t care which coins are used for what. So this is no advantage for a currency, and can even be a disadvantage, if funds received in good faith turn out to have a dodgy source. I am not a lawyer but I’m sure that some of them, at least, will get rich on debating this! ii) you can operate peer to peer anonymously without a third party ( contrast this with for example paypal where a third party keeps both parties details). The question is why would this be of especial interest to the average person. I’ve not entered into a financial transaction with any person or organisation yet that I need to withhold my details from. One of the key factors, other than trust, that makes a currency work as a medium of exchange is its ubiquity . Within a country or region everyone accepts and gives the same currency and approximately knows what they can get for it, not because it is the legal tender but because it is the most accepted means of payment. I really don’t want to have to pay for my milk in wibbets and my bread in wobbets. · exchange is easy and cheap. But if either of these criteria fail, then the less attractive currency will fail. We can say with the certainty that one attaches to the winner of network effects that one will dominate in the end. At the moment there are many such currencies, whereas “ there can be only one” or at least one global one and one per region/country. Much of the foregoing discusses the theoretical properties of bitcoin. For the man in the street, however, the daily concerns are more practical. There was an interesting report in the Evening Standard of a literal Payments Race that took place in June 2017 from London to Copenhagen. Participants tried to make the trip using only one type of payment; e.g. contactless, chip and pin, gold, coins and of course bitcoins. Sadly the result would not make Satoshi a happy bunny: Not only was the winner the gold carrier but the worst result was the bitcoin racer who failed to make the journey at all. The result can be found here and makes an interesting listen for any geeks wanting to understand the gap between the utopian technological theory and the practicalities of dealing with uninformed populace on one hand and very slowly evolving organisations on the other. I particularly liked the bit about the teenagers being the only people offering to accept bitcoin but not actually able to deliver the transportation. I’d also like to add that about 10 years ago I was an attendee on a consumer panel at the UK payments council looking at the abolition of cheques with a 2018 target. After a few years the plan was shelved. There are people at the other end of the spectrum from the geeks who are not going to give up the old ways and in some cases are physically unable to do so. Rome wasn’t built in a day and nor was the Euro. We will get there one day but I don’t see it happening in the next few years. As units of account, individually, Bitcoins obviously function just fine, but then so does every other currency when recorded digitally. The only difference with Bitcoin is the fungibility which we’ve already touched on. But we also need to account for masses of bitcoin. For global acceptance we need to be able to record national GDP at one level, and yet our developing country worker needs to be able to receive his bitcoin equivalent of a $1 a day. Bitcoins were created with a practical upper limit expected to be around 21 million. That’s not many right? But, no worries, it is possible to have bits of bitcoin, 100 million bits in fact, so in total we can have 2,100 trillion units. To give some perspective total global debt is around $200 trillion or allowing the full spectrum of units for those who only earn cents per day 20,000 trillion units. And, in any case, much of the consolidated figures we deal with aren’t currency transactions but the sum of those transactions for reporting purposes. The upper limit of bitcoin is only for the number in issue, it is not for total wealth and we can easily record on paper an infinite sum ( indeed I’ve already used a number bigger than 21m in this article). So we can theoretically account for enough bitcoin in the foreseeable future. So, great, for units of account purposes we can distribute our bits of bitcoin globally and there’ll be enough to go round when we want to account for global GDP numbers and for the kiddies sweets. The practical problem of scalability is not whether we can have enough bitcoin, it is recording and validating them as they start to become more accepted. Remember bitcoin aren’t fungible, each one is identifiable, but to make that worthwhile each one must be validated each time it is transferred. That’s like giving each cent in your account a unique identifier and noting how you spend it. But since bitcoin requires mulitple system participates to validate a payment, that means that you could flood the system just by making a load of £0.01 equivalent payments. Worth it just for the laugh, eh? i.e there just aren’t enough resources in the network to maintain the level of validations required. So something will have to give. And if something gives the initial vision is lost. Given that the core element that makes something a currency is "anything that is accepted as a medium of exchange", there are no barriers to Bitcoin and the like being a currency but the key question is how does it get past the general acceptance point? The real debate that generated the initial interest in these currencies was not about their capability to form a trusted medium of exchange, or about their operation as units of account but about their ability to be a store of value; an answer to the problem of traditional currencies such as the dollar or sterling being inflated away by the increase in the money supply. Indeed Satoshi’s original post on 3 January 2009 was accompanied by a reference to the UK chancellor’s increase of the money supply. Although we aren’t there yet. At the moment the number of bitcoin is still growing just like government fiat. But there are also issues of how to scale it emerging; for example see the split into Bitcoin and Bitcoin cash Aug 1 2017. So if the logic is extrapolated, it is currently a worse bet than government fiat! Contrary to what some believe, Bitcoin is NOT analogous to old fashioned gold. As we saw, at the beginning, gold was chosen because it had an intrinsic value as a decorative commodity that had uses. And that its value was dependent no just on how much of it was available but on its intrinsic use outside the currency system. Bitcoin, is a virtual construct. I can use it to make payments but whether there is one bitcoin, 21 milllion bitcoin or infinite bitcoins, I can never plaster it all over my ceiling or on my cakes. Outside the currency framework it is worthless. It’s only authority comes from Satoshi’s paper- it is therefore a fiat currency just like all the rest. The only difference is that (eventually) it has a finite level. Indeed had all bitcoin been mined and released at once or over time at the same price or with very slight increases in value and we had now reached 21 million spread widely the lack of intrinsic value might not have been an issue. The security issues coupled with the fixed supply might have ensured confidence. Instead, Bitcoin has not only been mined by a relatively small number of people but it has increased exponentially in value lately. When the goal of a currency is stability, a rapidly increasing value one is as destabilising as a hyperinflating/depreciating one. To understand the problem let’s look at an extreme example. Jack and Jill live on an island with 1 million people. The island has a currency which has depreciated due to increasing supply over many years. Jack and Jill decide to create a currency called ja-jis. They are able to brand it in a way that can never be copied and because of that there is an upper limit to the number of units. They use it in in exchange between themselves for a few years then open it to others. One of two people are interested in it as an Investment and acquire some – the price quickly rises. A few more people are attracted and the price rises again. 20000 people eventually own some and the price is very high. The remaining owners of the original currency certainly can’t afford any. But no worries they can just carry on using what they’ve got. And now Jack and Jill still own 90% of it- they have apparent vast wealth. And the 20000 have varying amounts. But the other 98% can’t afford to buy ja-jis and since they have no intrinsic value don’t need to. Without a “system administrator” such as a stable government where is the incentive for the average person to accept a new currency as payment? It is conceivable that the price will drop in an orderly fashion until more people are able and wish to participate but the drop is likely to put them off. In practice the bubble will pop as the 20000 lose faith and the currency will end up worthless. Contrast this will another similar island. There the government realises that faith in their money supply is faltering. They issue a new currency similar to that created by Jack and Jill but they do so by setting a rate on one day that people can exchange their old currency for. With 100% the currency widely held and used, it is a success and its value remains stable so there is no speculation in it. And that brings us back to the question of government power and how that relates to Bitcoin. So far different governments have reacted in different ways but there are some common themes. Japan has declared bitcoin legal tender on 1 April 2017. As a headline that sounds like a win for bitcoin holders. But the devil is in the detail, declaring a currency legal tender brings it under all sorts of other legislation including money laundering, which for a currency which prides itself on anonymity is a bit sad. China has been less subtle. On December 5 2013, China banned financial institutions from using Bitcoin. On 10 april 2014 its state bank cracked down on bitcoin exchanges. More recently , 4 Sept 2017, it has banned ICOs. And in the US, and bitcoin was declared a commodity on 18 Sept 2015 thus trapping it under another set of legislation. A finally, New York state, a leader in the gambling regulations already mentioned, released Bitlicenses in June 2015 with regulations specially targeted at the currency itself. And you can bet that if they think bitcoin transactions might exclude the taxman from the picture they will be even more vigilant. On March 26 2014 the IRS declared that bitcoin was to be taxed as property. Obviously, since ownership is hidden, this requires declaration but non-declaration is a crime and I can bet that they will merely transfer tax collecting to other points in the spending chain ( e.g sales taxes) if bitcoin take-up becomes more widespread. And of course ultimately they can always play the defence card citing the currency supports terrorists or rogue states. Then it is toast. Clearly the vision of peer- to-peer transactions, free of the influence of third parties, whether state or otherwise was just a trifle naïve much like the initial view of the internet. My contention is therefore that for a new currency to be accepted from the group up would require a complete breakdown in other elements of the State first. Readers, who’ve already looked at some of my predictions will know that there is likely to be significant instability financial and otherwise in the next three years. Does that mean Bitcoin and co will have their day in the sun or that something else will happen? Many moons ago, back in 2003 I think, I conducted a detailed review of major currencies and the dollar in particular, looking at key zodiac degrees highlighted in currency charts. I concluded at the time that around 18-19 degrees was an important currency degree, 22-23 degrees was also important particularly for the dollar and that 4 degrees Virgo was a significant dollar exchange point. It is interesting to see, then, that the charts for Bitcoin also highlight some of those degrees, as well as 0 degrees which does not feature in the dollar chart at all and does speak of new beginnings. Bitcoin Paper: Fri Oct 31 14:10:00 EDT 2008 NY – the chart is set for New York where the owner of the email server for the crypto group that Satoshi published through is based. It is my contention that this chart gives us an indication of the philosophy behind the technology and whether it will be well received and adopted. And while it might tell us something about the currencies I don’t think it is the best chart for that. One of the reasons I think that is the position of Pluto at 29 degrees Sagittarius in the chart. This contrasts with the later charts where Sagittarius has moved into Capricorn and becomes more concrete. This is further confirmed by Mercury in Libra – suggesting the idea is somewhat utopian. The Moon also appears in Sagittarius indicating the plans for changing society. Neptune is at 21 degrees, and again it is the later charts that we see it at the key 22 degrees currency point. The Sun is in secretive Scorpio, perhaps saying something about the founder. Then we have the configuration that describes our technology- Saturn at 18 degrees Virgo opposes Uranus at 19 Pisces and is supported by Jupiter at 16 Capricorn and Mars at 18 Scorpio. This chart ought to be the perfect chart for nailing Bitcoin’s future. But the uncertainly over the location weakens it. It can be used to answer value questions but with care. As mentioned Pluto is now in early Capricorn- we have our change made real. Mercury this time is also at an early degree. And once again we have a planet at 29 degrees, this time it is Jupiter. This is then showing that we are once again at a change point. We have created our Bitcoin but nothing more has happened. There is some cause for concern though as now the Moon in Aries is square Mars in Capricorn, some issues relating to the situation of the Bitcoin miners and the general public may be surmised. This is the best thing we have as an initial trading chart (though there was actually no trade involved- the first real trade was a pizza purchase in 2010). I think this chart can tell us the most about how Bitcoin may function as a currency. The fact that the node appears exactly on the Ascendant of the original paper’s chart seems to confirm this. But this time we see evidence of a currency actually forming. The Sun is now at 22 Capricorn which both echoes the Neptune at 22 Aquarius but also supports the Uranus- Saturn opposition again. We also have an Ascendant and Mid-heaven, albeit of the recipient and we see that the MC is at 18 Taurus, also a key currency degree but yet tending to support the other 22 degree configuration, while the Ascendant is at 23 degrees Leo opposite Neptune. Nevertheless we still have a hard aspect to the Moon. It is opposite Mercury. We are looking for a medium of exchange so no aspect would be worse, but I can’t help feeling this might lead to some challenges. Indeed I see this as perhaps being the problem of sheer volume of transactions to be validated. But what surprised me about all three charts is not what was there but what wasn’t. 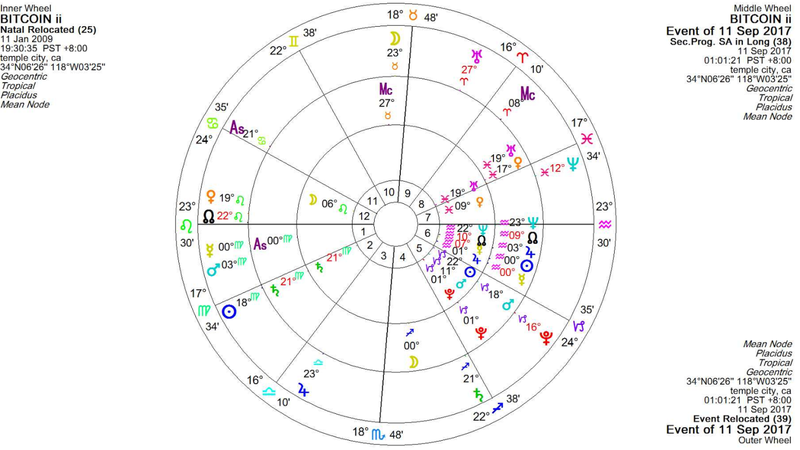 In the US dollar chart there is a conjunction between Neptune and Jupiter which widely opposes the currency’s Saturn. It is this conjunction at 28 Libra that represents the faith elements of the currency and its tendency to inflate towards the infinite. While the Jupiter in the bitcoin mining chart is square the dollar’s Libra conjunction, the bitcoin payment chart makes no aspect to it. However the progressed Neptune in the dollar chart is at 0 degrees Scorpio, so the emphasis , particularly in the bitcoin transfer chart on 0-2 degrees is suggestive of a link. And this applies particularly too the Jupiter at 1 Aquarius. So I am going to focus on this 12 Jan 2009 chart for the purpose of analysis and forecasting. Our next date is the weird hard fork of 15 August 2010. Saturn opposed Jupiter and squared the Bitcoin Jupiter; big tech surprises. These were accentuated by Uranus quincunx the progressed Moon at 29 Leo- something needed to change, and a Mars square Mars (attack). The Sun was at 22 Leo on the Ascendant throwing light on it all. Anyway, Bitcoin was still worth less than a dollar. Some new exchanges were created on 27 March 2011. Neptune was at 29 degrees, on the point of changing things significantly. The Sun was making a favourable trine/sextile aspect to the Moon/Mercury opposition encouraging the world to use the currency. Mercury the key to exchanges was at 23 Aries and was trine the Ascendant. However Saturn was again opposite Jupiter but now it was at 14 degrees square Mars. The moment was not without challenges. On 19 June, when Bitcoin was valued around $18, Mt Gox was hacked. Neptune had reached 0 Pisces indicating a change of environment. 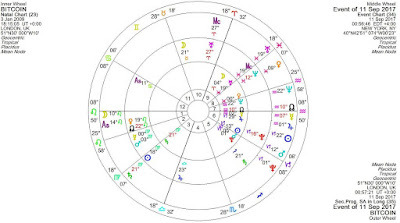 The progressed Moon was trine Mars, Jupiter was square the chart Jupiter , Pluto was quincunx its Moon and transiting Mercury triggered it all off with an quincunx to Mercury. Another exchange hack, this time Linode, happened on 1 March 2012. But this was less publicised and there are less specific indicators. However it is apparent the wider conditions weren’t so good for the currency with the progressed Moon conjunct Saturn and transiting Saturn at 29 Virgo. Our next key date is 10 April 2013 when volume broke Mt Gox. In six months the Bitcoin had risen from $12 to $180. On the day, and really all we need to know, was that there was a conjunction of the Sun, Mars, Venus and the Moon at 23 Aries. Progressed Moon was trine Progressed Mercury making trade much easier. The progressed MC had reached 23 Taurus square the Ascendant. And Pluto continued its slow transit over Mars. There appears not to be too much new in the December chart of the Chinese ban, perhaps the chart relocated to Beijing would show more. Bitcoin was $1000 by now. But there is more to say by 24 February 2014 when Mt Gox closed. Now transiting Neptune is conjunct the transiting Sun and quincunx the chart’s Moon. 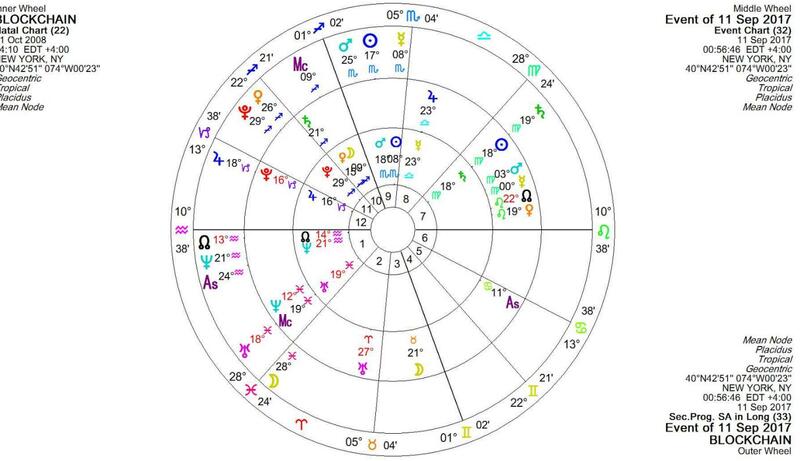 Saturn has reached 23 Scorpio opposing the progressed MC and square the chart Neptune. A Jupiter Uranus square also aspects the chart’s Mars. A definite time of challenge. A month later on 2 March the IRS reached its decision on bitcoin taxation. Transiting Sun opposed the chart Moon and the cardinal cross was at one of its most intense times. Clearly this had global significance. And these challenging conditions continued to weigh on the fledgling’s price all through that year and 2015 when Pluto continued to conjoin the Bitcoin Mars, Uranus was around 19 Aries and Saturn moved back and fro across 0 Sagittarius. By the end of 2015 the focus was still tough but was shifting to media events; notably the 8 Dec 2015 fake Satoshi identification. The progressed Moon trine Venus and Sun square progressed Venus, progressed Ascendant and Sun at 29 degrees as well as Jupiter conjunct Saturn in the chart all showed the focus. But Bitcoin was still stuck at around $400. But it was the next few months, devoid of relevant individual events, that indicated the new trajectory. In August 2016 the Ascendant progressed into Virgo and applied to a trine with the chart Pluto; things were getting intense. In October there was a key turning point for investors as the progressed Moon crossed the IC. Then in November there was a real boost to the currency as the Sun progressed into Scorpio and accompanied progressed Mercury in a conjunction with the Bitcoin chart Jupiter. This was bound to blow things out of proportion. And it did. For the next six months with the progressed Sun, Mercury and Jupiter getting closer together the price rose and rose. On 1 April 2017 when Japan deemed Bitcoin legal tender, the price was $1000 and even some tricky aspects weren’t enough to cancel the power of the conjunction. The last gasp was the Saturn station at 21 degrees ended and as the Sun – Mercury conjunction by progression was exact, the progressed Moon at 0 Sagittarius was square the progressed Ascendant and sextile that conjunction and Uranus was trine Mars at the month end. Does it get better than that for a price bubble? Well actually astrologically it could. Throw more Neptune into the mix and the impact may be pretty much infinite. But for the moment Neptune isn’t doing that. Happy in the knowledge that our chart describes the action to date well, we can now go forward and look at what might happen next. Of course, as always, caveat lector: this is experimental forecasting on a newish chart. Progressed Neptune will remain at around 23 degrees and on the Descendant of the chart till around 2040-2050. That is the timescale we are probably looking at for change. But over the next few years progressed Venus will conjoin Uranus suggesting volatility of both value and media frenzy. By December this year (2017), Neptune will be sextile the chart Mars and progressed Sun will be approaching Jupiter. Transiting Jupiter will be on the MC. These elements suggest another, albeit smaller rise around. These configurations will remain through 2018 too. On the other hand Pluto will continue to square progressed Mars and transiting Saturn will conjunct the chart’s Pluto. That is highly depressive. I suspect the Saturn aspect will win and we won’t see any significant price increase for Christmas. There is even a risk that it might die in its current form. By around 7th Jan 2018, transiting Jupiter and Mars cross the IC. And the Sun and Venus transit join Pluto in transiting progressed Mars sextile progressed Venus. Expect huge trading issues, and attacks at the foundations together with more media activity. February sees a key turning point with Jupiter at around 22 degrees square Neptune and progressed Mercury retrograding back to Capricorn and the established way. April is challenging as Saturn forms a conjunction with Mars at 8 Capricorn- there maybe legislative difficulties or suspensions of trade. Around May 5th Jupiter crosses the IC this time retrograding and throwing up the issues of March again. Uranus square’s Mercury; a very important time for the currency and the technology. June is accompanied by significant drama. Uranus squares that progressed Sun and Jupiter. Huge swings in value could result. July and August is a difficult time when there are technical challenges as transiting Mars retrogrades and stations on progressed Mercury while Saturn retrogrades to the chart Pluto. September brings the final transit of Jupiter across the IC and brings to a close the events of February onwards. 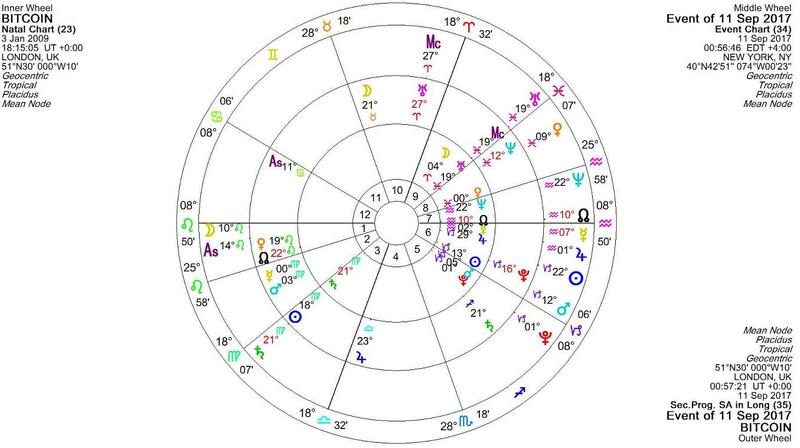 Around October 8th, Jupiter is back at 23 Scorpio and Uranus once again Square the progressed Sun, Jupiter conjunction. Once more I expect large fluctuations. And from the 2nd November the situation is more challenging as Jupiter opposes the progressed MC. Nevertheless Mars crossing Neptune may bring a buying spree. Late November and December seem to confirm that as Jupiter sextiles the progressed Sun /Jupiter configuration. Although once more this creates technical issues reflecting the Uranus square progressed Mercury. In 2019 The progressed Sun will be approaching the progressed Jupiter, once more this gives a positive slant, though perhaps not as much as mid 2017. January 2019 in mixed, Uranus is stationed square the chart progressed Mercury which I take to be revamping of the technology taking more traditional matters into account. Saturn crosses Mars for the first time and Pluto will now reach the chart’s Sun. This has some of the feel to December 2017 rather challenging. March to May sees this continue and more trading restrictions. However there is a boost to the technology opportunities from the media as Uranus sextiles the progressed Sun and Jupiter again and transiting Jupiter conjuncts the progressed Moon even though square Uranus and the progressed Venus. And when Jupiter trines the Ascendant and sextiles Neptune there might be a lot of froth to the price. By June Neptune has reached 18 degrees and things should eb looking interesting globally. Jupiter conjncts the progressed Moon but now is square Saturn as well as progressed Venus etc , a critical time for technology development. Pluto, however remains close to the chart Sun and Saturn to the progressed Mars. Don’t expect everything to be so rosy. In August things maybe briefly positive as the progressed Moon sextiles the Descendant. September and October see really fundamental changes to the technology as Pluto not only conjuncts progressed Mars still but now also squares progressed Venus and Uranus whileJupiter trines the same point. Then Uranus once more squares the progressed Sun and Jupiter. It looks like all change. And it might even be positive value wise by the end of the period as transiting Jupiter and Venus together trine the Ascendant and progressed Moon. But that is a short term boost as afterwards progressed Venus separates from Uranus and moves oppose the chart Saturn. 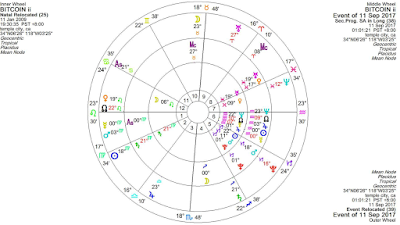 By December there are likely to be massive flows of funds everywhere ( not just in relation to this), Jupiter is conjunct Pluto, Pluto conjoins the chart Sun again, Saturn the progressed Mars and Uranus squares the progressed Sun Jupiter configuration- a perfect storm. The pace of change is rapid as progressed Mars sextiles Venus and Uranus. 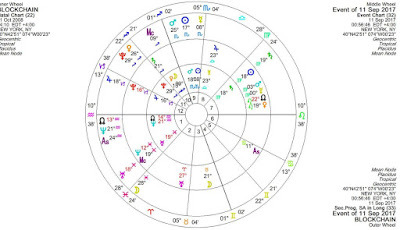 2020 begins with the major Pluto conjunct Saturn – on the chart’s Sun. That is not good. At the same time the progressed MC moves in to Gemini- we are in a new environment. By around 27th February things move on again,. The progressed Moon has shifted into Capricorn and Saturn is on the progressed Mercury- there are definite restrictions now relating to date and exchanges. April to June everywhere is a long period of adjustment. Neptune at 19 degrees sits on the chart Uranus, suggesting confusion regarding the technology- perhaps it is not clear exactly how thinsg can be harnessed for the best going forward currency wise. Saturn is conjunct Jupiter- growth is constrained, and the progressed Moon reaches Pluto- not a great time for an investor. July may see the birth of a new version and certainly huge expectation. Neptune is at progressed Uranus and Venus and sextile progressed Mars and Pluto together with Jupiter ( rather than Saturn) is on the chart Sun. August and September see this continuing but Saturn remains on the progressed Mercury, restrictions on trading may remain in place throughout. October and November are likely to see the completion of the process as the 2020 Pluto Jupiter and Saturn conjoin the Bitcoin Sun. December is then the start of a whole new ballgame. Progressed Venus opposes Saturn, bringing the values right down. Pluto remains on the Sun, at best creating something out of the rubble. But Saturn and Jupiter move into Aquarius and reach the exact progressed Sun Jupiter conjuntion. Now we will see what the future will look like. Briefly we can look at early 2021 too. The impact on value will be felt when Saturn reaches the progressed Sun in March. With progressed Venus opposite Saturn it looks like everything is restrained despite the Neptune conjunction with Progressed Uranus and Venus. Indeed with Neptune starting to oppose the chart Saturn everything maybe depressed. Added to this Pluto reaches the progressed Mercury. The idea is being reformulated completely by April. So in summary, having looked at the realities of the currency and the charts, and although I expect a bit of soul searching in the coming months I don’t expect Bitcoin to end this year and if it does the other crypto -currencies won’t. This debate will go on with a mix of re-workings and upsurges until 2019. By then we’ll see the bigger picture in terms of real world currencies. I do believe that there could be more upside in 2019-20 but I think in the end the governments will work out a way to restrain the more utopian elements of the technology and together with some of the banks start to incorporate some of the more palatable elements into their own state backed currencies. Bitcoin and its friends will be over by 2021 in their current form. But so will the credit boom that characterised 1981-2020. The long term story will continue over the coming decades. Another country, another historical astrological reference: this time an observatory. So much knowledge in the past, lost or demoted - when it is so, so valuable. And now the review for the last 2 months of 2018. This won’t be too detailed as for many countries my wording was continues much the same and actually for many places that was the reality. So this time we’ll just focus on the highlights. Overall though it was a short period I scored quiet highly. UK – I forecast a serious leadership challenge for December. I rest my case. Pretty much nailed Sterling too as it was variable but relatively range-bound for much of these 2 months and there were issues relating to the Governor. The Ftse forecast was fairly accurate too. Although December did have an overall downward shift the main emphasis of the 2 months was flat but lots of trade. It is July and we need another update don't we?